There is no question that many of the worst cases that our lawyers handle involve motorcycles. Too frequently, cars and trucks simply do not see what is there to be seen: a motorcycle with the right of way. 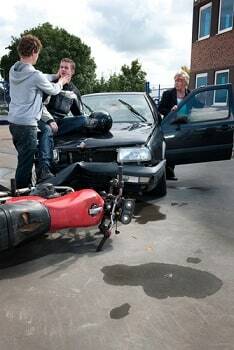 Our lawyers handle serious injury bike and motorcycle accident cases in every county in Maryland. We have gotten scores of settlements and verdicts in motorcycle accident cases. 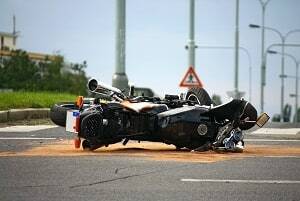 For obvious reasons, we see a lot of serious injuries and wrongful death motorcycle accident cases. When it comes time for settlement or trial, no other people have helped our clients in more meaningful ways then we have. In wrongful death cases, family, friends, and clergy help victims come to grips with the tragedy of losing someone they love. In serious injury cases, doctors and nurses do what they can to help the victims, as have family and friends. Motorcycle accident victims want one thing from their lawyers: help in getting them as much money as they possibly can. The justice system has nothing else to offer, unfortunately. We are simply trying to help our clients maximize the value of their motorcycle accident case to give them the best possible measure of compensation for their injuries. So how much money will you get for your motorcycle accident case. The starting point answer is: we have no idea. We probably have more information on average personal injury verdicts for various types of injuries in the country. Go Google "average motorcycle accident settlement" or "average motorcycle accident verdicts". You will get a lot of hits but no one actually answers the question. According to the only study we have seen - done by Jury Verdict Research - the average motorcycle accident verdict nationally was approximately $560,000 and the median verdict award just over $70,000. This tells us that the serious claims, where the victim is badly hurt, really increases the average. Beyond this data, you have two paths for information to try to calculate the value of your case. First, you can look to the average verdicts for specific injuries. We just gave you that. But they don't tell you much. Or, you can look at jury verdicts and settlements in other cases to try to piece together what you think the compensation will be in your case. Please keep in mind that both of these methods of trying to figure out the value of your case are flawed. Trite expressions flow easily here. "Every case is different" and "You can't evaluate any case without reviewing every medical record and knowing what both the doctors and the fact witnesses are going to say." These are all true. But human beings want information that lets them at least try to gather information and extrapolate what that means about the value of their case. Without any further ado, these are examples of motorcycle accident cases in Maryland where a settlement was reached or a jury rendered a verdict. Man was killed when driving his motorcycle on the favored roadway and was hit by a truck in Prince George's County, Maryland. Defendant alleged contributory negligence of the man who was killed because he was driving too fast. Defendant's evidence of this appeared to be limited to the fact that the man was driving a motorcycle that is commonly seen traveling at high rates of speed, and that he did not have a motorcycle license. The man was survived by a great family. His wrongful death/survival beneficiaries were his young son and his daughter, who had to grow up without a father. This wrongful death/survival action claim settled for $750,000. This case settled for less than its true value because of the size of the insurance policy and the family's desire for resolution. There was a disputed liability case where the Plaintiff's facts of this case revolved around Maryland's Boulevard Rule. Plaintiff suffered an above the knee amputation. Five witnesses testified at the trial. All agreed that the Defendant was at an intersection controlled by a stop sign, and that the conditions were clear. The Defendant pulled out from the stop sign and traveled less than 20 feet before the impact took place between his vehicle and the Plaintiff’s vehicle. All five witnesses also agreed that the impact took place in the Plaintiff's lane of travel. Clearly the Defendant failed to see the Plaintiff's vehicle before pulling out into traffic. Plaintiff was driving a motorcycle southbound on the inner loop of I-695 (the Baltimore Beltway) just south of the exit for Old Court Road. Plaintiff was traveling in the left lane immediately prior to the occurrence. The northbound and southbound lanes of I-695 are divided by a concrete jersey wall. There is an “emergency crossover” in the area where the occurrence took place that permits (according to the posted signs) “emergency or authorized vehicles” to make a u-turn from one side of the Beltway to the other. The Defendant was driving a company truck. His vehicle was equipped with amber-colored safety lights on top of the cab, which were operating at the time of the occurrence. The motorcycle accident occurred after Defendant made a u-turn through the emergency crossover from the northbound inner loop of I-695 onto the southbound outer loop. Plaintiff sustained severe and permanent injuries including multiple rib fractures, comminuted fractures of the left elbow and thumb, a right anterior tibial wound, multiple abrasions and contusions, and extensive scarring. This case settled for $390,000. Plaintiff was driving his motorcycle and the defendant made a left hand turn in from of him. Plaintiff suffered torn LCL in his knee, aggravated preexisting herniated discs in his back, and sustained various soft tissue injuries as a result of the motorcycle accident. The defendant admitted the motorcycle collision was his fault, but claimed that the Plaintiff's real problems were not caused by the accident, but by injuries that preceded the accident. The jury in this case awarded $300,000. Our lawyers fight to create value for people who are hurt in a motorcycle accident. Call us at 1.800.553.8082 to speak to a Maryland lawyer experienced in handling auto accident claims, or click here for a free internet consultation. Generally, our firm handles only serious injury motorcycle accident cases but we will take questions from anyone who needs direction with their accident claim.